We’d love your help. Let us know what’s wrong with this preview of Venceremos! 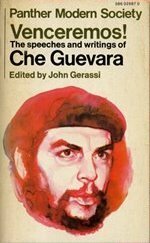 The Speeches and Writings of Ernesto Che Guevara by Ernesto Che Guevara. To ask other readers questions about Venceremos! The Speeches and Writings of Ernesto Che Guevara, please sign up. His belief in the necessity of world revolution to adva Ernesto "Che" Guevara, commonly known as El Che or simply Che, was a Marxist revolutionary, physician, author, intellectual, guerrilla leader, diplomat, and military theorist. A major figure of the Cuban Revolution, since his death Guevara's stylized visage has become an ubiquitous countercultural symbol and global icon within popular culture.